WASHINGTON (Reuters) - General Motors Corp.'s mostly electric Chevy Volt turned in a lackluster performance for efficiency in its first series of road tests by product raters at Consumer Reports. "We would have really liked to have loved it," David Champion, director of Consumer Reports auto test center, said Monday after announcing the organization's top auto picks for 2011. "It was fun to drive and the ride quality was pretty good. But when you look at the finances, for us it doesn't make any sense," Champion said. He said consumers seeking value and top fuel efficiency would be better off buying a top-performing gasoline/electric hybrid like the Toyota Prius or a Fusion by Ford Motor Corp. The magazine considers ownership costs, reliability and performance in assessing value. Consumer reports found that GM's first generation plug-in hybrid, which is the resurgent automaker's signature entry in the industry's drive for greater fuel efficiency, fell well short of its maximum range potential under battery power. Champion said the Volt that Consumer Reports bought and tested ran for 26 miles before the vehicle's gasoline engine kicked in. After promoting a 40-mile electric-only range for most of the Volt's development, GM last year introduced a sliding scale of between 25 and 50 miles. The Toyota Prius, by contrast, gets 51 miles per gallon and the Ford Fusion gets 41 mpg. 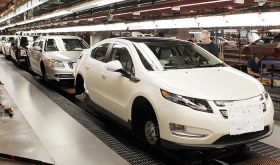 The Volt, which rolled off the assembly line in December, retails for about $41,000 before a $7,500 federal tax credit. The baseline Prius sells for $23,000 while the Fusion hybrid costs about $28,000. Consumer Reports drove the Volt at its test track in Connecticut under the coldest temperatures this winter, and Champion acknowledged that car may perform better in temperate climates and in more city-like conditions. Large lithium-ion battery packs used to power vehicles can underperform in cold weather, partly because energy drawn from them is used to heat the interior for passenger comfort. Power drain can also occur when the car's air conditioner is running. GM has said that extreme temperatures can degrade electric range, but the automaker found Champion's assessment of the Volt hasty. "The technical reviews have been positive and it was unusual to have a snapshot under the most cold and snowy conditions this winter in the Northeast," said GM spokesman Greg Martin. "There needs to be a greater sampling of driving conditions that mirror the typical consumer experience," Martin said. Champion said Consumer Reports has yet to test Nissan Motor Co.'s all-electric Leaf, which retails for $35,000 before the federal tax credit.